Below, we’ve provided answers to some of the questions we occasionally receive about Benchmarking Club. For further information on the benefits of membership please contact the service’s Product Manager, Cath Earl. 1. How many routes will be available to benchmark? There is no limit to the number of available routes to benchmark, provided that other comparable members are moving cargo on those lanes. 2. What is the difference in the source data between the Benchmarking Club and Drewry’s existing freight rate products such as the Container Freight Rate Insight and World Container Index? The source of the Benchmarking Club’s freight rate data are its members, providing their weighted average contract rates by lane to Drewry who then aggregate these to provide the benchmark rates. This contrasts with the Container Freight Rate Insight and World Container Index where the sources are freight forwarders/NVOCCs that provide Drewry their buy rates to ocean carriers. 3. How do you take the volume size of the different customers into account? The Benchmarking Club provides average rates by shipper size as well as the overall average. We identify three categories of shipper size for each route – small, medium and large. 4. Can you use the Benchmarking Club database for ad hoc enquiries other than waiting for the quarterly reports? Yes. 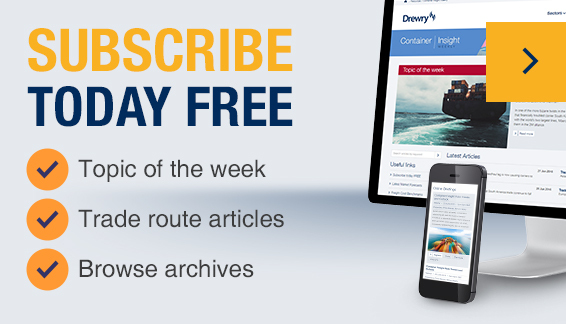 Benchmarking Club members have one free site licence access to Drewry’s Container Freight Rate Insight (published online at www.drewry.co.uk/cfri) which contains freight rate benchmarks (based on forwarder buy rates) on over 600 trade routes around the world. But the contract freight rate benchmarks are only distributed once a quarter and only for those lanes on which you are sharing your own contract rate data. 5. Will Drewry consider equipment types other than dry containers and NORs such as ISO tanks, flexitanks and reefer containers? At some point in the future it is quite feasible that members will be able to benchmark different types of cargo moving in equipment other than standard dry containers. But for the moment we are offering dry 20ft, 40ft, high cube and NOR containers. 6. What is the geographical spread of the Benchmarking Club’s membership? Current members include multinationals from all over the globe, as far and wide as Asia, Europe (including the Nordic states), the Middle East, North America and South America. Furthermore, Drewry has received strong interest from a very large number of organisations based all over the world. Current and prospective members are benchmarking cargo rates on lanes moving in and out of all of these regions as well as some routes to / from Africa and Oceania. 7. How do you propose to moderate different contract periods of benchmarking periods? Drewry takes account of this in several ways. Updating the freight rate data of each member every quarter enables the Club to capture changing contract rates across different agreement periods. We require members to detail the validity period of each submitted rate so that we know when the pricing is up for renewal, validity of benchmarked rates in included in the reports. Accompanying each freight rate template request is a short questionnaire covering non-standard agreements, including details of contract term arrangements. 8. Most contracts are for 12 months so why the need for quarterly reporting? Many contracts may be for a year but most contract rates are subject to some form of variable surcharge, such as for bunker fuels (BAF). Meanwhile, many longer term contracts are index linked and quarterly reporting will enable capture of this variation. Also, the anniversary of each contract will be different and quarterly reporting captures this dynamic picture, as explained in answer to question 7 above. 9. Are you comparing port-to-port rates only or FOB rates as well? Most benchmarking is centered on port-to-port rates (including OTHC and DTHC) but we will accommodate routes to/from inland origins/destinations to a limited extent. As Club membership continues to increase we will be able to roll out more comprehensive point-to-point benchmarking options. 10. On the quarterly template, what does “direct/indirect” mean? “Direct/Indirect” refers to the carrier service to which the rate relates. We simply need to know if the weighted average rate relates to direct or indirect (i.e. transhipment) services. If you have rates for both then we require that you provide these separately due to the price differential between the two service types. 11. What are some of the key benefits of the Club? To name but a few; confidence in your rate levels, clarity for internal reporting, supports negotiation strategy, clear view of market developments and best practices, indication of cost saving opportunities. The rates in the benchmark are current, i.e. valid in the reporting month which presents a ‘real time’ accurate picture of the market. An example from a market perspective is to obtain understanding of how recent BAF reductions and Low Sulphur Surcharges have affected rates. 12. Does Drewry’s Benchmarking Club comply with legal and regulatory requirements? Yes. Drewry has undertaken extensive legal and regulatory review to ensure that the Benchmarking Club fully complies with competition and antitrust regulation. Regulatory bodies such as the US Federal Maritime Commission have been informed of Drewry’s Benchmarking Club. 13. Is it in any way possible to determine the identity of the carriers in members’ freight rate templates? Not at all. Members are only required to provide the weighted average rate across all carriers they are using on a particular lane, not each carrier’s rate nor the identity of any carrier. Also, it will be against the Club Rules for a member to provide Drewry the identity of their carriers in relation to their freight rates. Drewry will not disclose the identity of carriers used nor individual carrier rates to Benchmarking Club members.